This is the men’s room at Kuma Restaurant in Tenleytown. 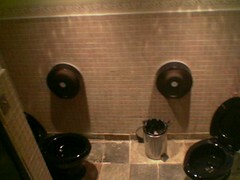 Yes, there are two toilets here, one facing the other, without any walls between them. The exact reason for this remains shrouded in mystery.